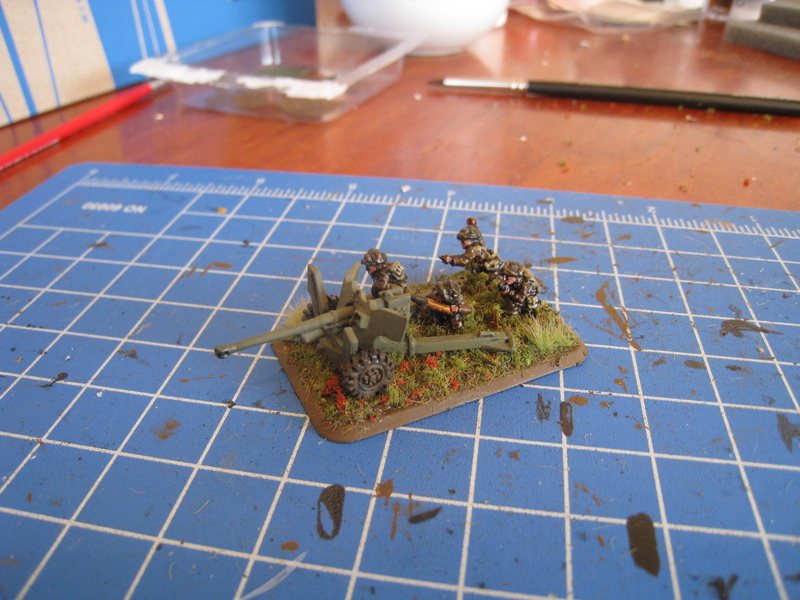 Well, firstly here are the better close up pictures of my 6pdrs, which were painted as part of the Snow Challenge. The battery of 4 guns. And a close up of one gun. They are nowhere near as shiny in real life- it was the angle of the sun that did it! They are a little shiny due to ink washes, but definitly not that much. The poor gunner is loading a normal AT round, I bet he is wishing he had APDS! The Guards Rifles have a need for more support. M10's, 25pdrs, tank support and of course air support will all be on the way for them, hopefully sooner rather than later, so I can start gaming with them. 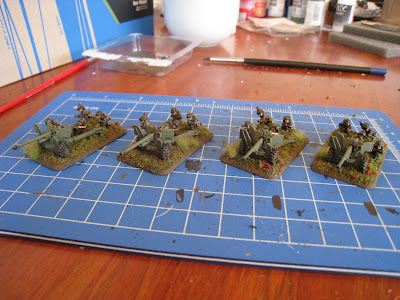 There is a Late War GT in November, which I think I will try to take my Coldstreamers to; so expect to see more of them! Now, onto Napoleonics. My British Guards force is still short two infantry units, as well as the crewmen for my second artillery battery. Now I own it all, so it is just a matter of assembling and painting. Plus everything needs to be based. It would be good to get them done as soon as too- just so they are done! Here is where they are at right now. So, coming along very well! There is a tournament in Wellington on the 25th; so I think I will take the Guards to that. Right now, I am thinking of using the smallest possible army in Lasalle, British Guards with Heavy Cavalry support! That should be small enough that I can get it on a plane (hopefully). Now, there is more for the Napoleonic Period. So I decided a while back that having only one army of Napoleonics was a bit silly, especially when no other locals play Lasalle (yet). 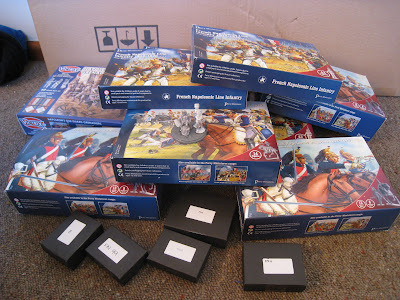 So, I made the call to buy a French Army too (tough decision...not). So, as of Thursday, my French have arrived! So, in that pile of plastics is 4 boxes of Perry Infantry, 3 boxes of Perry Dragoons, 1 box of Perry Heavy Cavalry, 1 box of Victrix Old Guard. The boxes at the front are metal Perry Infantry commands, as well as some Perry mounted officers. And of course, the big (little) man himself is there too! So, the plan is to get at least some of these guys painted for Conquest, where we are going to run a big Lasalle demo game of Waterloo, but more on that soon! So, there are my 3 projects for the forseeable future, hoping to have more FOW done by the end of the week, and some test figures up for the Frenchies. 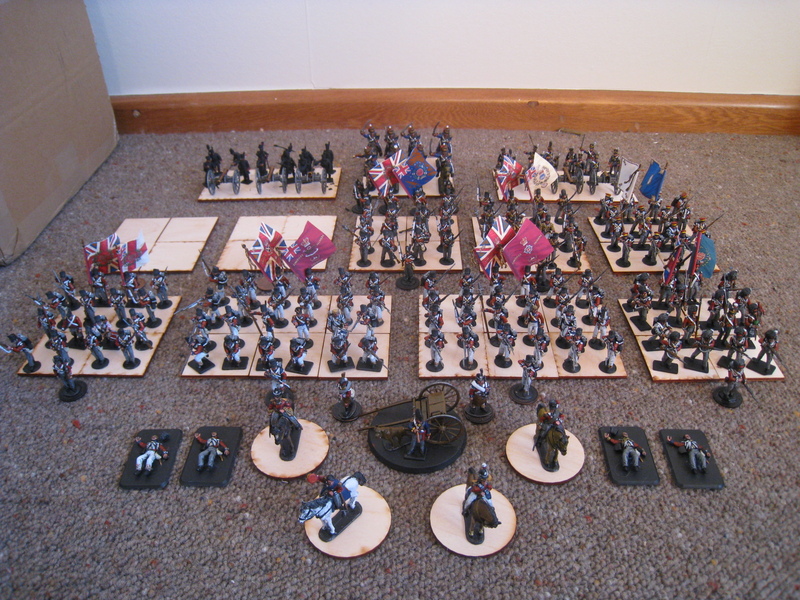 My British Napoleonics are a little on hold until I can restock my painting supplies. The fact that Jason and I have been able to loan an OPFOR has really helped with project 28mm Impetvs. I like the look of Lassalle but Craig has almost put me off it with his enormous artillery park. You wont see that in a plastic box! What the hell is an OPFOR? "An opposing force (abbreviated OPFOR, used in the United States and Australia) is a military unit tasked with representing an enemy, usually for training purposes in war game scenarios." So the arty park is not necessarily needed then? I'm not quite clear on how Lassalle works but I guess the guns are part of the supports and you have options for those, what could I have instead? No, you need to have it, and you want it. Despite what Craig may say, Russian artillery is very good! The coe Russin force for 181`2 has 10 guns + 6 vbattalions of infantry. 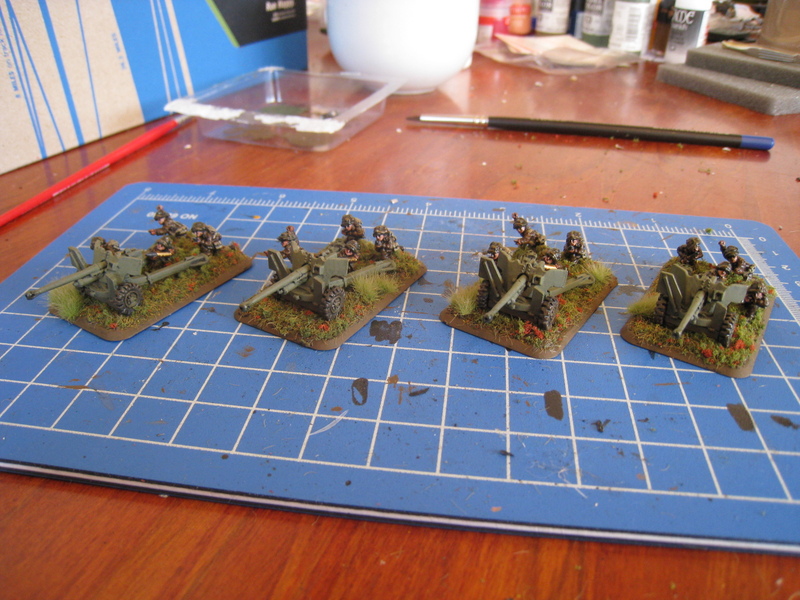 Artilelry fires as a unit and atough there is one more gun than a French battery (although should be 6 guns) they aren't thant much more effective. Our few games of 15mm Lasalle found it hard to actually find decent positions to fire artillery without my own infantry getting in the way so I can't see them being that useful. More important gamewise appears to be being able to (as the French can) start with organic cavalry brigades on table to get that decisive edge- although I do like the way most Cav comes on from reserve to represent it being released from a higher command. If my Cuirissiers ever get on table they should have fun! Of course the downside is you don't know when they will arrive and they won't have long to do any damage.